The Northern Michigan University Greco-Roman program might not have put forth a World Teams Trials champion over the weekend in Las Vegas, but what they did do was show plenty of hope for the future, especially going by recent history. The 2016 Olympic Trials, of course, only featured six weight divisions and eight wrestlers who trained in Marquette showed up in Iowa City. A respectable number. In 2017, the Northern wrestling room almost had that tally in one weight class alone (five at 66 kilograms). Altogether, nearly 20 wrestlers who trained on site at Northern Michigan participated Saturday and Sunday at the 2017 Senior World Team Trials spread over seven of the eight weight classes. Quite a jump. Alex Sancho made the finals at 66 kilograms, his third Trials final, and took familiar foe and 2012 Olympian Ellis Coleman (Army/WCAP) to the deciding third match of their series only to fall 2-1. 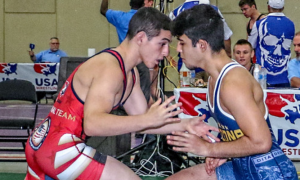 Sancho got past former University World Team member Sahid Kargbo (Patriot Elite) in the quarters and then teammate Anthonie Linares in the semifinals before his latest run with Coeman. It was likely a frustrating ending for Sancho, but at still only 23 years of age, he will surely be around for a long, long time. Another step in the right direction was taken by Anthonie Linares. 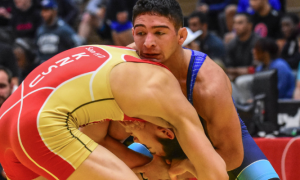 Linares entered at 66 kilograms following recent forays at 71 which saw him take second to Patrick Smith (Minnesota Storm) at the Nationals and third at the Schultz. Linares barely missed out on third place when he lost to now-two-time National Team member Brian Graham (Minnesota Storm). The other big story perhaps for Northern Michigan was fellow 23-year-old Colin Schubert. Schubert just missed out on the Olympic Trials last year, taking eighth at the Nationals and then second at the Last Chance Qualifier in Cedar Falls. On the big stage this year, he did his best to make it count. 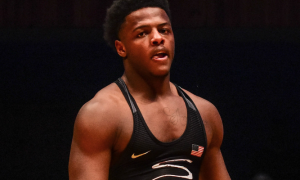 Schubert’s two losses on the day were to both halves of last year’s 66 kilogram Olympic Trial final — eventual 2017 champ at 71 Patrick Smith (Minnesota Storm) in the quarterfinals and 2014 Trials and ’16 Olympic Trials winner RaVaughn Perkins (NYAC) in the third place bout. That’s right — Schubert made it all the way to the National Team match. In between his two losses were a dominant victory over Alex Mossing (Foxfire) and a back-and-forth affair with Olympic Training Center resident athlete Cody Pack (Legends of Gold). Two-time Junior World Team member Dalton Roberts (59 kg) didn’t have the day he was hoping for, but he’s another on the young side (turns 21 in July). 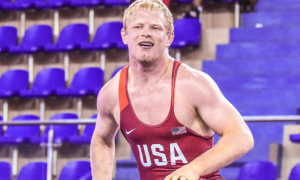 A quarterfinal loss to 2017 Junior World teammate and bronze medalist Taylor LaMont (Sunkist) set him back. Roberts, incidentally, defeated LaMont back in February at the Dave Schultz Memorial. He then rebounded with a win over NMU compadre Andrew Ibarra before dropping a close 4-2 decision to Max Nowry (Army/WCAP), who wound up taking third. Along with Sancho, NMU’s two most well-known studs, both at 75 kilograms, had an up and down couple of days in Vegas. 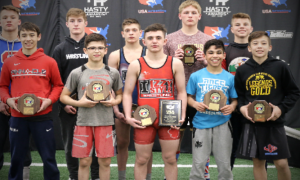 On Thursday, Jesse Porter clinched the Junior World Team Trials title and a wrestle-off with chief rival Kamal Bey (Sunkist, world no. 18) in June. On Saturday, Porter was turned back by eventual champ Mason Manville (Army/WCAP). He advanced to the consolation semifinals and was stopped by Jon Jay Chavez (NYAC). But he finished strong in the fifth-place bout with a technical superiority victory over Nick Tarpley (NYAC). Kendrick Sanders was a pick for many as someone who could potentially advance to the final round, but his day went about as badly as he probably could have imagined. The uber-talented Sanders was lights-out in his first bout as he reverse-lifted Calvin Ochs (Nebraska Golden Eagles) and held him down for a fall. But in the quarters, he got caught in quicksand versus Dillon Cowan (Army/WCAP) and never recovered, getting both tech’ed and injured. Finally, the 2017 Greco-Roman World Team Trials welcomed in the return of Parker Betts. Betts represented Minnesota Storm but he did (most of) his training in Marquette. His entering the tournament was kept under the radar, therefore, he was not included in our previews for the 130 kilogram class. 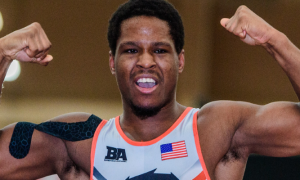 Betts was a University World Team Trials champ in 2015 and a runner-up last year along with taking sixth at the US Nationals/Olympic qualifier. For his first event back in nearly a year, Betts put forth a very encouraging effort. He lost his first bout via tech to 2016 Nationals bronze and 2017 Schultz champ Malcolm Allen (Minnesota Storm). He took a forfeit for his initial consolation bout and then got a nice win over Pete Gounaridis (Army/WCAP) to make the consolation semifinal. Betts hung in there with talented Jacob Mitchell (Army/WCAP), falling 4-0. In the match for fifth/sixth, it was another loss to Allen, this time a much-closer 8-4 decision. Either way, Betts being back is good news. 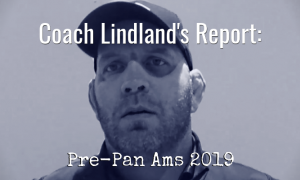 Before his hiatus, he was widely viewed as an important future piece of the 130 kilogram puzzle and him now committing to competing again means a weight class in need of some depth definitely has some more of it.